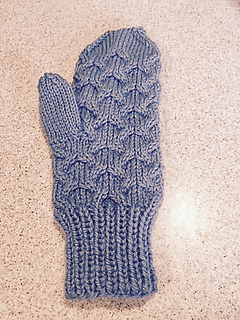 This pattern is for a heavily cabled pair of mittens. 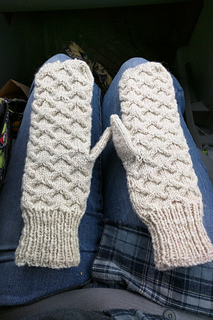 They are designed to fit snugly to your hand, and may be knit to whatever length you require. The afterthought thumb is created by binding off stitches mid-knit, then picking up those stitches and working from base to tip of thumb. The original yarn was handspun clun forest yarn in a worsted weight. Long wools like Masham, Cheviot, Icelandic, and Gotland would be terrific for mittens, as they resist water and pill less with heavy use. 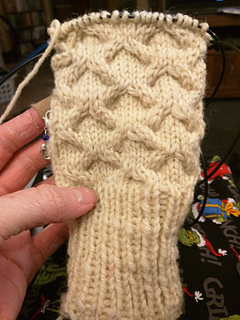 Sharper needles or a cable needle are recommended for this project, as repeated cabling can make for tired hands. Pattern is written for a single long circular needle used in the magic loop method or for two circular needles.